P90X is a comprehensive home fitness program that includes 12 DVD workout routines, 3-phase nutritional plan, fitness guide, and your expert trainer, Tony Horton! P90X can get you in the best shape of your life in 90 days. So, why then do people fail to get results and just quit P90X? Don’t be one of those people! As a Team Beachbody Coach, I get tons of questions from frustrated people who do not see results or can’t get through the P90X program. These tips will help YOU avoid the same pitfalls that so many fall into and learn how to get the most out of P90X. Is P90X for you? Take the P90X fit test. If you never exercised before or have a very low activity level, then P90X is NOT for you. If you are not in good physical condition and attempt an extreme program like P90X, you will have a tough time staying motivated because you won’t be able to complete the exercises and you will increase your chance of injury. I get emails from people telling me they can’t even complete one exercise on a P90X DVD routine. If this is you, try another fitness program to get in condition to prepare for P90X. I recommend Power 90 with Tony Horton. Power 90 is a less intensive 90-day workout routine that will bring your fitness level up so you can do P90X. What are you eating? In order to get results with P90X you must follow a good nutrition plan. P90X includes the P90X 3-phase Nutrition plan and you should follow it. I get emails from people who are upset because they are not seeing results but yet they are eating fatty foods and other junk. Guess what! If you work out daily with P90X, but continue eating junky, fat foods, you will not see results. You cannot compromise with nutrition. Make time and do the P90X workouts 6 days per week. You are responsible for your health and fitness. It’s simple. If you do not do your P90X workouts you will not reach your desired fitness goal. Many people make excuses and just can’t find the time. You find time to sit around and do nothing, play on your computer, watch tv, and other things. Schedule time every day for your exercise. If you continually miss workouts you will not succeed with the P90X fitness program. It’s up to you. Make the commitment and be sure you can stick to it. Think about this: 90 days is going to pass whether you do P90X or do nothing. Hmmmm. Be patient. People are so impatient and expect results from P90X in 2 weeks! 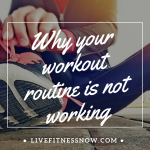 Let me tell you – your body took a long time to get in its current condition and it’s going to take some hard work and time to get in better condition. P90X is a 90 day fitness program so NO, you won’t be fit in 2 weeks. Work through the soreness. For the first week or two of P90X, you will be REALLY sore! Do not give up! You are sore because your body has not done anything for a long time. You may be tempted to skip your next workout because you are sore from P90X. Working out will help move the lactic acid that’s built up in your muscles and make the pain all better. Don’t be a baby. Your body will adapt over time. You can also try the P90X Results and Recovery drink which helps reduce soreness and helps your muscles recover faster from an extreme workout. You are frustrated because you can’t do a pullup or a pushup. If you cannot do a single pullup with the pullup bar, then use resistance bands. Start there and build up to a pullup bar. If you cannot do a pushup with straight legs, then start on your knees and build up the strength to do a regular pushup. There is always a modifier on the P90X fitness DVD routines to show you modified version of an exercise. Don’t let your ego get in the way. Purchase a legal version of P90X. When you purchase illegal, pirated versions of P90X, you usually will end up missing DVDs, DVDs that don’t work right, missing nutrition guide, missing fitness guide. Buy the P90X real deal – don’t miss a thing! Do track your progress. Log into Team Beachbody (it’s FREE) and post your before picture. Log your workouts and workout with buddies in the online SuperGym to stay more accountable. You can even win money just for working out. Team Beachbody is a vital fitness resource and its there for you! Does P90X work? You bet! I know this firsthand because I did 2 rounds and got in the best shape of my life after round 1! I was so hooked that I did it again. There is no trick to P90X – P90X builds muscle and burns fat. You decide if you will be in the best of shape of your life after 90 days pass or not. Commit, Succeed.